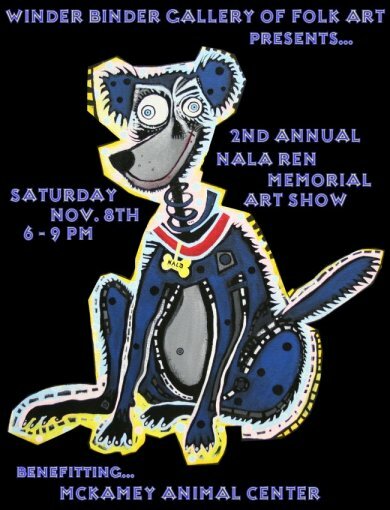 2nd Annual Nala Ren Memorial Art Show is this weekend! Wednesday, Nov. 5, 2008 , 10:04 a.m. Animal and art lovers are invited to celebrate their passions at Winder Binder Gallery of Folk Art Nov. 8 when the gallery hosts the 2nd annual Nala Ren Memorial Art Show. “It’s kind of a perfect meshing of the art gallery and pet adoption because so much of the folk art that we have here has cats and dogs on it to begin with,” said Winder Binder owner David Smotherman, a longtime dog lover. Named after Mr. Smotherman’s late dog, Nala Ren, the event will take place from 6 to 9 p.m. to benefit the McKamey Animal Care and Adoption Center. Winder Binder owner David Smotherman and his dog Abby will host the upcoming Nala Ren Memorial Art Show Nov. 8 to benefit the McKamey Animal Care and Adoption Center. To support the center Mr. Smotherman and the artists he represents will donate 25 percent of the day’s sales to McKamey. While last year’s event raised $1,000 for the animal haven, Mr. Smotherman said he hopes to see the numbers double this year. Given the varied price range of the work that will be available, he said he is confident that his goal will be achieved. According to Mr. Smotherman, the artists represented by his gallery are more than happy to help him with his mission. The cost of the items that will be for sale will range from $50 to $500 with commissioned pet portraits going for a standard rate of $75 per painting. At least two artists will be on hand to do pet portraits for customers, though Mr. Smotherman asks would-be patrons to bring pictures of their pets for the artists to work from rather than their pets themselves. Mr. Smotherman’s own dogs, Abby and Ella, will be in attendance at the event, however, as Mr. Smotherman almost always keeps them around the shop. “Even when you are having a bad day those dogs are still there wagging their tails,” he said. Admission to the art show is free and hors d’oeuvres will be served. Wednesday, Oct. 1, 2008 , 10:32 a.m. The 3rd annual One Bridge Folk Art Festival will add to the celebratory spirit of the North Shore on Oct. 4 and 5. Hosted by Winder Binder Gallery of Folk Art owner David Smotherman, the festival will be held in the Frazier Avenue parking lot adjacent to the Walnut Street Bridge. As a regular host of art events such as Who-Fest and Art ‘til Dark, Mr. Smotherman welcomes the opportunity to present the public with a more intimate and focused folk art festival. He said such an atmosphere is one favored by folk artists and their fans, himself included. New friends are likely to join in the creative fun, as One Bridge will overlap with Wine Over Water on Saturday. Mr. Smotherman purposefully chose to have his festival intersect with the wine tasting that leads people toward the Winder Binder parking lot. The 20 exhibiting artists will offer a wide variety of work priced to suit every collector. Such is the aim of most folk art, which is at its core whimsical, accessible and, for the most part, affordable. Buyers will have the option to purchase prints of the festival’s poster, which was designed by Charles “Niznik” Clendenin. 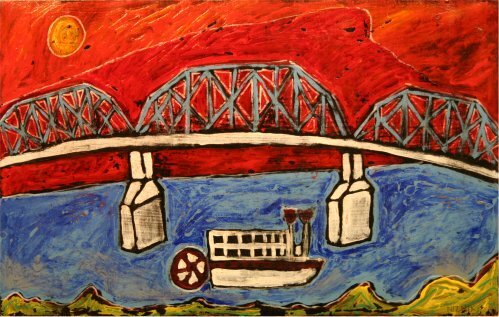 Mr. Clendenin’s work depicts a vibrant Walnut Street Bridge, and 50 limited edition prints will be available for purchase. Jewelry will also be for sale alongside paintings and drawings at the rain or shine event. The festivities begin at 10 a.m. Saturday and noon Sunday. The closing times are loose, according to Mr. Smotherman, who recognizes the nature of most swinging parties. For more information visit winderbinder.wordpress.com. Limited edition print by Charles “Niznik” Clendenin. 50 numbered and signed prints will be available for pre-order at the show (they should be ready within 2-3 weeks). $100. Thanks to everyone who made Gallery Hop 2008 such a rousing success! The turnout was phenomenal…there were a number of times throughout the evening that people were having to wait out on the sidewalk just to get in. Chattanooga’s art community was out in full force Saturday as over 20 galleries and studios held open houses during the annual Gallery Hop. For many involved with local art galleries, this year’s Gallery Hop reaffirmed their belief in Chattanooga’s current artistic presence and its future potential. Many attendees of the Gallery Hop also said they were impressed with the wide variety of artistic expression found in the Chattanooga area. Dr. Fahs’ wife, Kim, said she especially likes going to the artists’ studios so that she can see where they produce their work. “It gives you a better appreciation for all the steps that they go through,” Mrs. Fahs said. The Gallery Hop is a way for local artists and gallery owners to showcase what Chattanooga’s artistic community has to offer in terms of originality and creativity. “All the galleries kind of working together to pull off this day, it creates a real sense of community,” said local artist Doug McCay, whose work was displayed at the In-Town Gallery on Frazier Avenue. Katie Shrum,17, an art student at Hilger Higher Learning, said she believes the Gallery Hop can bring more appreciation to local Chattanooga artists. “It definitely needs more attention because there are so many amazing artists here, and they don’t get recognized the way they should,” she said. Ms. Shrum also said she was impressed with the artwork she had seen during the Gallery Hop. Most of the local artists participating in the Gallery Hop also were selling their works, some of which had a price tag of $4,000 or more. Many also answered questions from visitors about their work process and individual pieces.